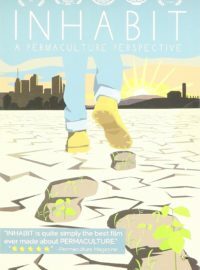 This documentary is an introduction to permaculture for the general public, and speaks eloquently to the point of permaculture as a ray of hope in our world. SUBURBS: The permaculturists interviewed are — Eric Toensmeier, Lisa Fernandes, Lisa DePiano, and Steve Whitman. There is a short sequence about composting toilets and another about using bicycle trailers to collect compost and recycling. Scenes are included of neighbors working together to implement permaculture designs. Multiple edible crops can be grown together in a small yard. The pawpaw, Asimina triloba, is an edible fruit native to North America and frequently mentioned in North American folklore. CITIES: The people included are — Dwaine Lee, Andrew Faust, Paula Amram, Ari Rosenberg, Luis Sanchez, and Pandora Thomas. Topics include: growing food crops on rooftops, capturing rainwater from sloped roofs, planting neighborhood gardens and rain gardens in conjunction with local residents, and providing job opportunities for urban dwellers and ex-offenders. The potential of the urban landscape will surprise you! FARMS: In this segment the experts are — Michael Phillips (2017 NOFA Conference keynoter), Keith Morris, Steve Gabriel, Rhamis Kent, Susana Kay Lein, and Mark Shepard. There is a sequence about growing shitake mushrooms on logs in a forest setting (the main pests are slugs, which are controlled by foraging ducks). Susana Kay Lein plants grain crops in succession without any tillage — an idea from Japan (The One Straw Revolution). New Forest Farm in Wis-consin replicates the “oak savanna” of ancient mammoths and bison — a fantastically productive habitat. I grew up in the 1960s when environmentalists were saying: “humans are bad — we are a planetary disease.” This film says: “wait a minute — it doesn’t have to be that way. Humans CAN be good.” We can not only sustain ecosystems but we can restore and regenerate them as well. Scenes with children are prominent in the film! The Natural Farmer is the newspaper of the Northeast Organic Farming Association (NOFA). It is published quarterly as a 48-page newsprint journal. The paper covers news of the organic movement nationally and internationally, as well as featuring stories about farmers from New England, New York and New Jersey. Each issue contains a 16 to 24 page pull out supplement on a particular crop or topic. The paper also contains how-to-do-it articles suitable for gardeners and homesteaders.